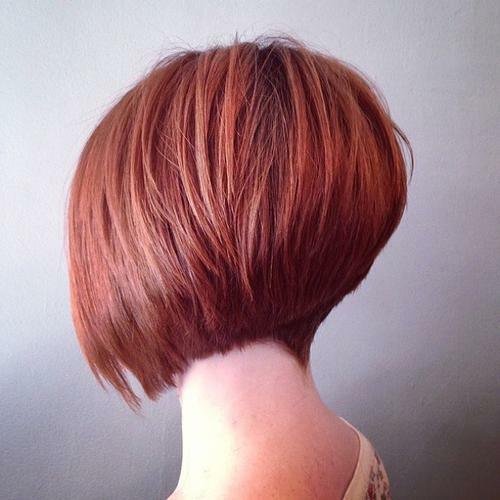 Trend-setting graduated bobs can be geometric and edgy with a fabulously stacked-back on thick hair. But there are also plenty of A-line bob styles for fine hair that are edgy and asymmetrical or soft and curvy! 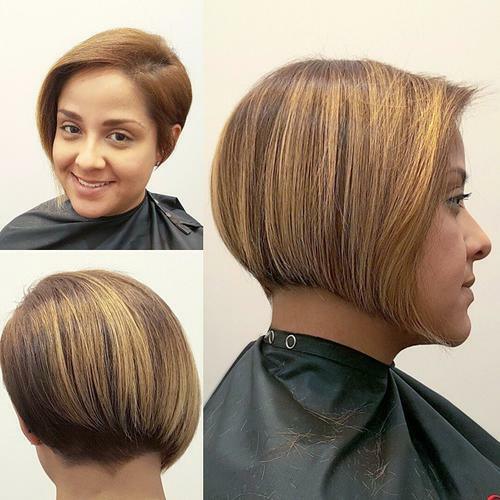 Today’s new gallery of style ideas has a huge range of haircuts and the latest hair color trends, including pale neutral blondes, beige-blonde, yellow highlights and a stunning dark-brown bob with fabulous orange highlights! So why not take a look right now! Golden-brown is a rich, medium-brown color that’s making a come-back in the latest hair color trends. It’s a lovely shade that suits a wide range of skin-tones and makes a great warm-brown alternative to copper-reds. As a gray-covering color, golden brown is a face-softening choice for hair that used to be natural dark-coffee. This is the most forgiving shade of blonde and recommended for pale skin-tones that need a little color to light them up. 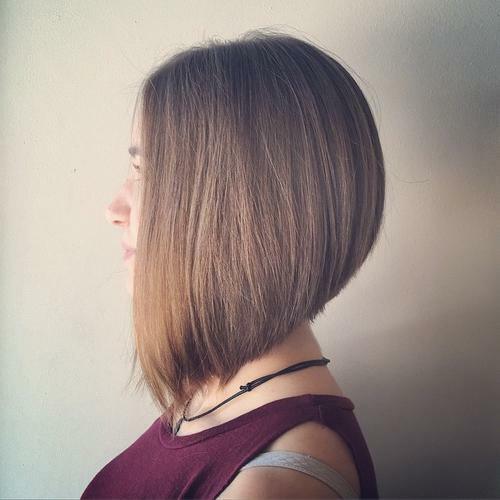 This chin-length bob with a same-length cut and bangs is a style that suits many face shapes, except round. The chunky, vertical wave pattern adds lots of extra volume around the head, which suits long, angular or thin face shapes. 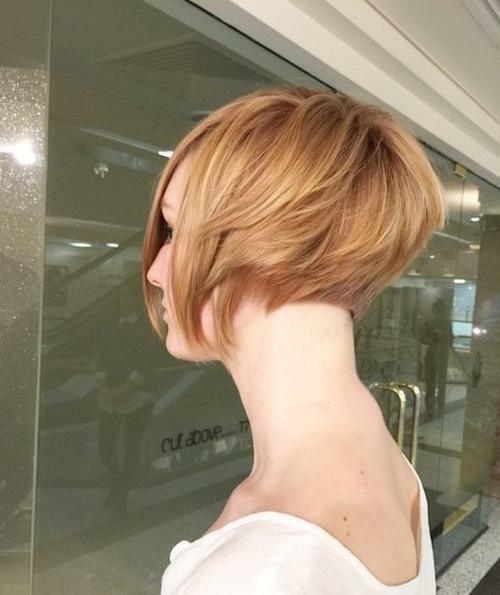 This short bob shows off the model’s long, slender neck and shoulders, making it an excellent choice to wear with a cocktail dress of evening gown. The stacked back is accentuated by a subtle touch of beige-pink and the disconnected side layers are styled in reverse pin-curls, leaving a softly curved line framing the face. 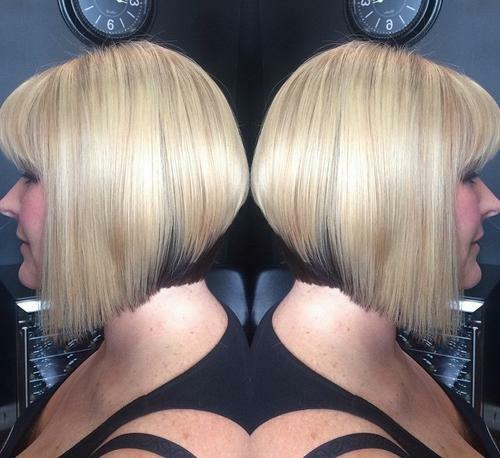 The extreme asymmetry of this stacked bob makes it a trendy and flattering choice for round, long and heart faces. The low side-part creates a flattering, strong diagonal line across the face and extra-long bangs blended into the side. The short side leaves a clean profile contrasting with the much longer side that hugs the jawline. This pretty hairstyle has gentle curves that match the gentle strawberry-blonde color beautifully! The hair is styled to curve under at the back, to add volume in hair that’s not thick enough for a chunky stacked back. The shape radiates from the darker crown, creating a deep fringe that focuses attention on the eyes. And there’s added texture from darker roots at the back. 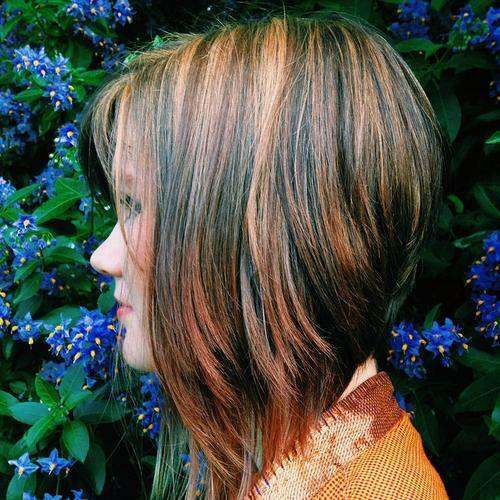 Here’s a great hairstyle makeover for long, shapeless hair. 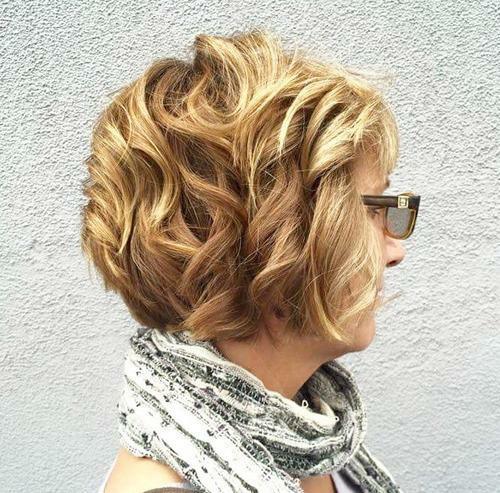 The result is a face-flattering, trendy bob with neutral blonde balayage. The ‘after’ photos show volume up higher, around the crown, with tapered sides that reduce unwanted side-volume. With diagonal bangs, this is a great style for a round face. This is a unique, new look and a very appealing hair color idea. 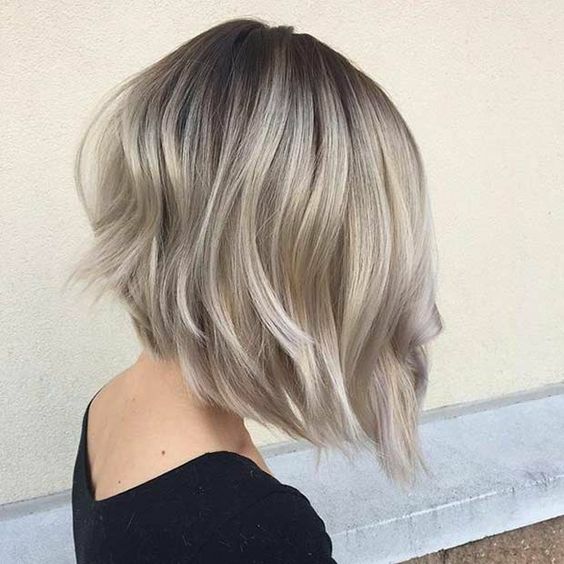 Instead of dark roots, this bob has dove-gray roots on top and highlighting the stacked-back. What a fabulous idea, which complements the pearly, white blonde perfectly! 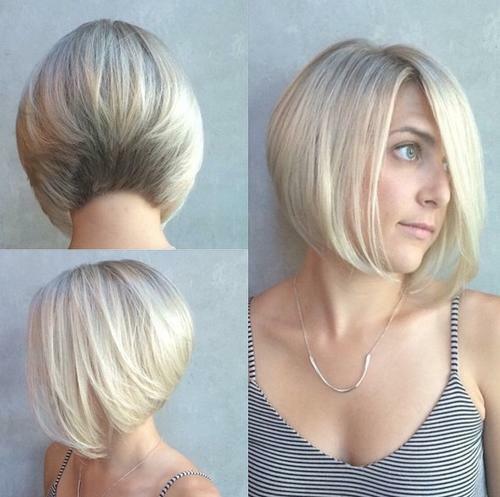 The pale colors and curved shape give this medium bob a very appealing femininity. I love the confident look of this black bob with bold broad strokes of orange balayage! The two colors are a strong contrast, but together they make a very fresh and attractive hair color idea. The stacked-back is left black to highlight the graduation, but long layers around the collar bone have fabulously feathered, orange tips! 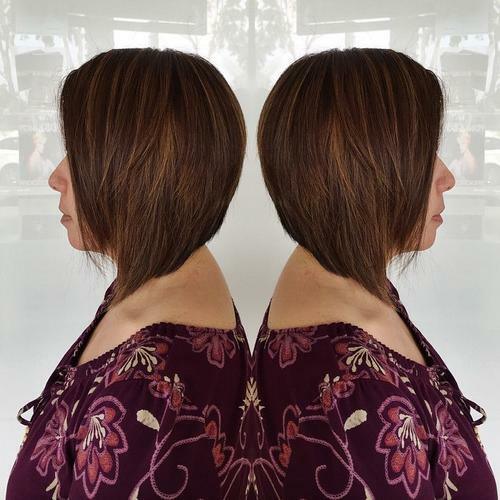 This short bob haircut takes control of thick, coarse hair with a stacked back and side layers creating a lovely tapered curve that hugs the neck. The side-parting and strong, straight lines make this a flattering and easy-care style for oval, round and heart faces. A-line bobs are suitable for fine and medium hair textures lacking the density required for a stacked back. 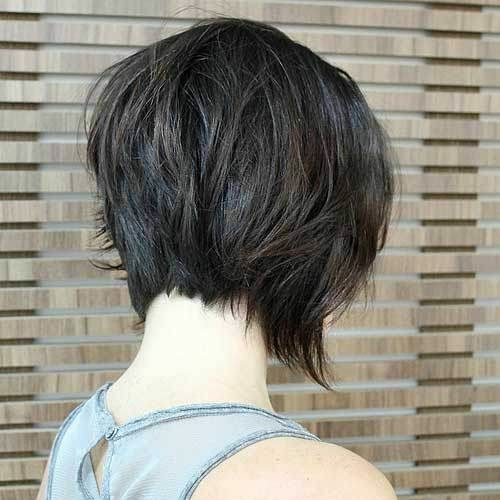 The back has a contrasting brown color at the nape that cleverly accentuates the angle down to the front. 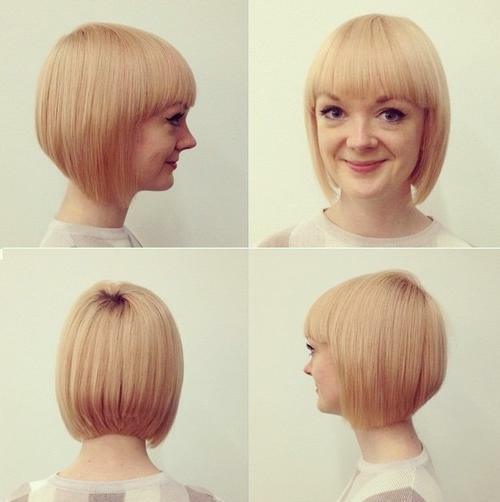 This pretty bob has straight-across bangs and strong lines around the face to suit a round or heart shaped face. 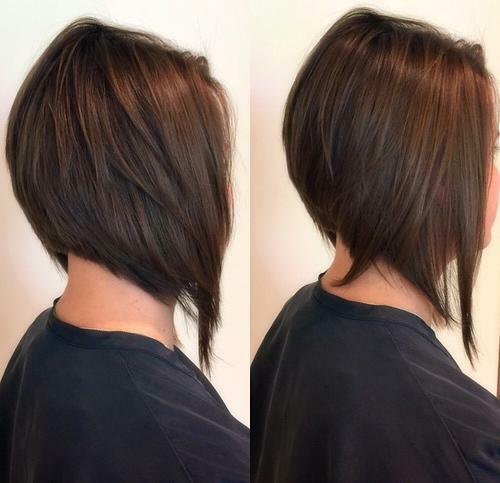 This amazing asymmetric Mohawk can be achieved by styling an asymmetrical graduated bob, giving two completely different looks! The clipped sides have a band of dark-brown color that’s also seen at the roots. 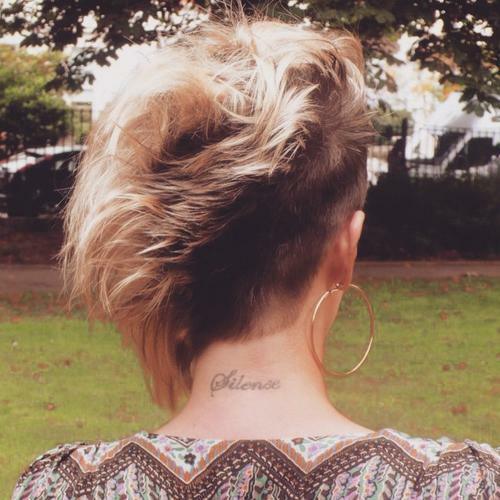 This harmonizes perfectly with the gorgeous, neutral beige-blonde on the feathery diagonal Mohawk! 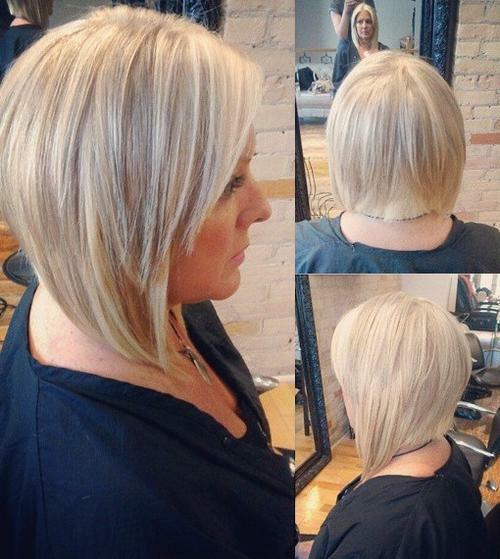 The gold highlights in vertical lines give this asymmetrical bob lots of texture. The tips are layered near the ends to create a natural curve above blunt lines. This isn’t the best hair color for the model, as there isn’t enough color contrast between complexion and hair. A darker shade would be better, with no yellow tones. Add a deep warm shade of copper-red to warm-up your whole look and show-off thick, healthy hair! 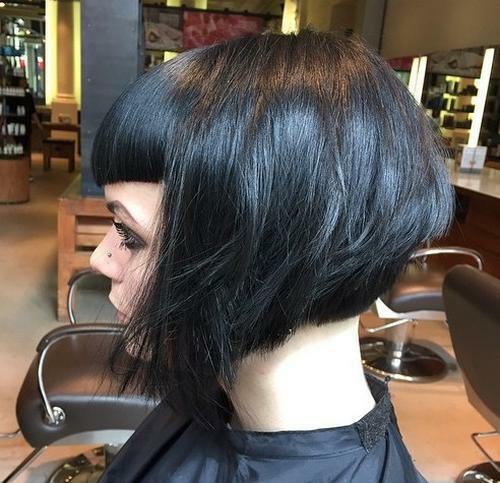 With a single ‘point’ placed just above the nape, this bob style also draws attention to a slender neck . 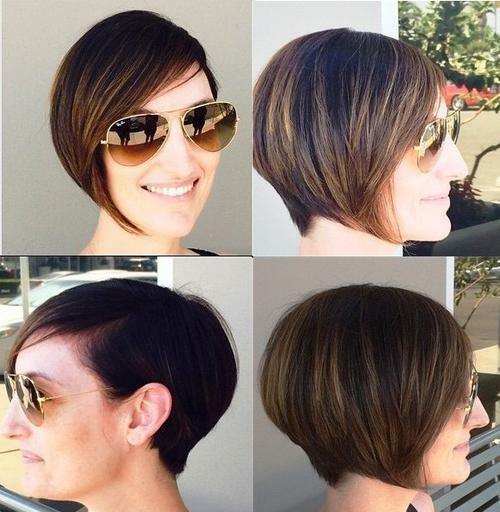 Straight, chin-length bobs suit round, heart and oval faces. There’s no law making it compulsory to have blonde highlights in mousey or dark-blonde hair. This natural shade of neutral brown is quite fashionable right now. You can accentuate your unconventional style with a highly asymmetrical cut that has shaggy edges contrasting with smooth curves. 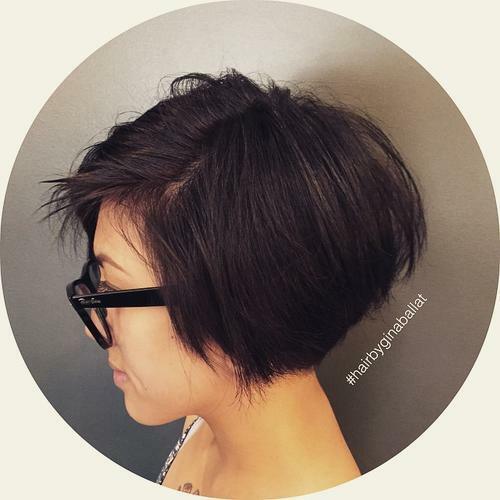 Thick graduated bobs look stunning with a choppy line that adds even more thickness to the tips. 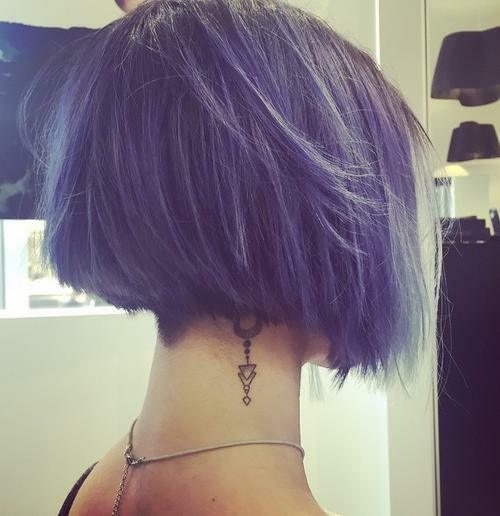 This fabulously eye-catching purple bob has black roots and disconnected layers with feathery tips around the chin. The single point back is a really cute detail, too! 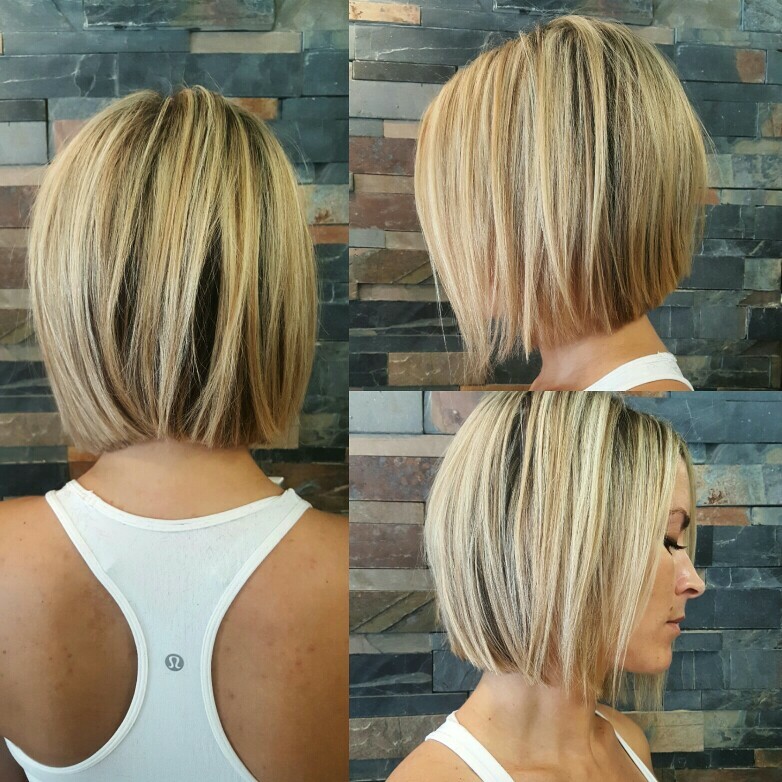 Here’s another great every-day style idea for thick hair in a layered A-line bob that’s nicely tapered into the neck at collar-length. The hair is lightly teased to create a full curved silhouette and has feathery disconnected tips at the sides to add width to a narrow chin. 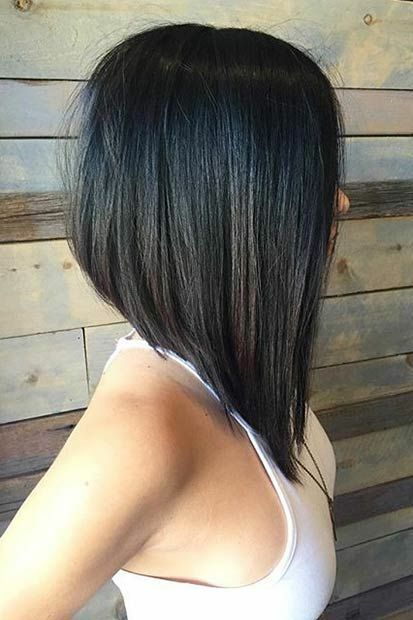 There’s a hint of gothic style underpinning this super-chic, short bob on black hair with gorgeously glossy gray tones. The deep bangs are shaped into a V over the bridge of the nose for an angular look. Brushed-forward sides emphasize disconnected layers that are tousled to soften the line around chin-level. This idea works well on fine or medium textured hair that’s soft enough to drape well. 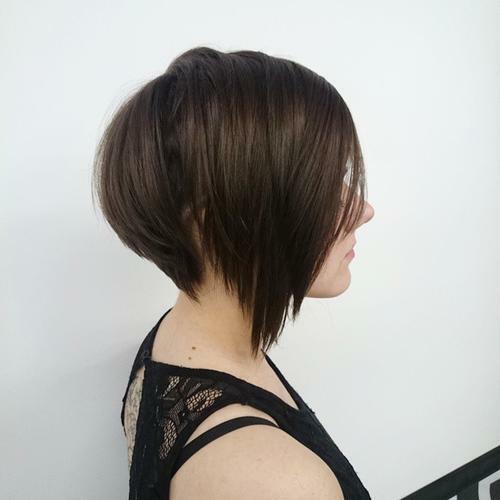 The back is stacked in close layers to give extra volume and a rounded shape. The graduated line down to the front is very steep, creating a strong angle which is accentuated by the brushed forward styling. 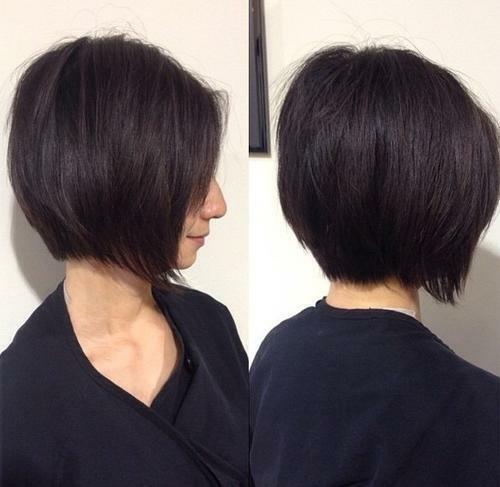 This softly curved A-line long bob has added volume in the back from crown to nape, above stacked layers. The line down to the front is steep, but the forward side sections are styled to curve under, softening the line with textured tips. 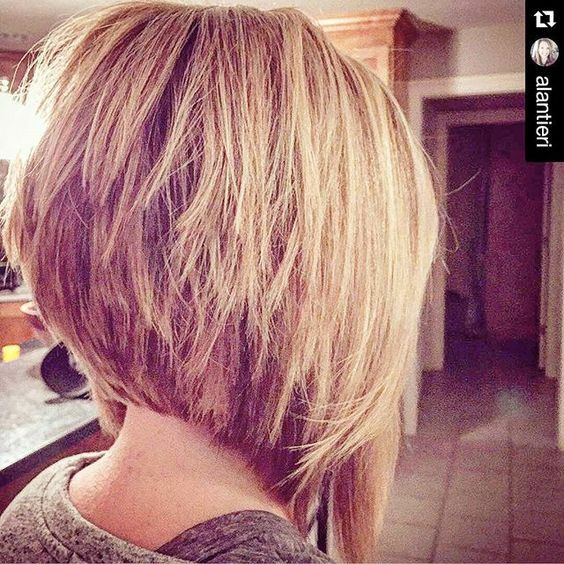 This wheat-blonde bob has a wide, chunky look at the back, from the unusual straight line along the nape. The side sections are cut in disconnected layers, creating a smoothly graduated line to the collar-bone that contrasts with the choppy back. With a center- or side-parting this style suits oval, round and heart faces! 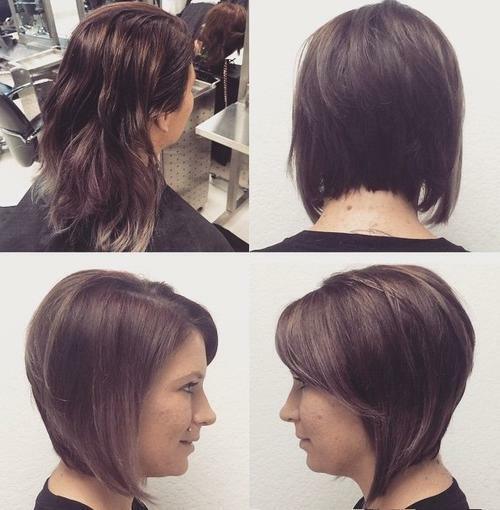 Are you feeling inspired to try something new on your bob? I hope so! There are so many new hair colors and ideas right now – making it easy for everyone to find a haircut and color inspiration for a fantastic new look!